In the 1800's wealthy New Yorkers filled the center of Newport's Harbor area with their lavish vacation houses, essentially creating Cliff Walk real estate. Looking to find a new place for their summer homes, they began building on an undeveloped cliff on the southernmost tip of Aquidneck Island. Grand mansions went up along the beautiful coastline overlooking Rhode Island Sound and the Atlantic Ocean. As decades passed, residents of these homes improved the walkway along the water said to have been made by the Native Americans, and created a scenic escape from town now visited by thousands every year. Find out more about Cliff Walk real estate below the listings! Cliff Walk homes now include some of the most exquisite waterfront properties in the world. Many of the mansions including Marble House and Rosecliff share the marvelous view from the cliff and can be seen from the pathway. There are many private residences along the walk as well, and are some of the most magnificent properties the island has to offer. 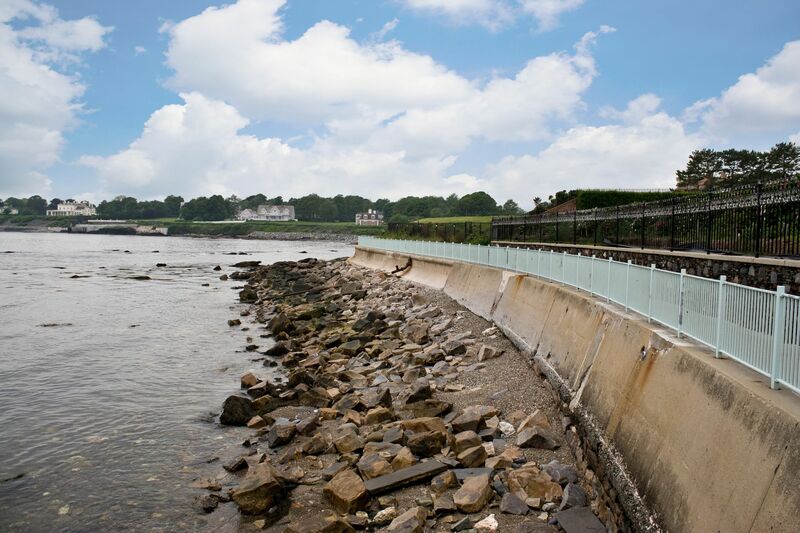 Cliff Walk is close to the International Tennis Hall of Fame & Museum, the Newport Art Museum, as well as the neat shops and sumptous restaurants on Thames Street. As well, the popular First Beach (Easton's Beach) is a short drive, while Sachuest Point National Wildlife Refuge is also not far. The park makes a great day trip if you want to get out and explore. When it comes to nearby schools, William J. Underwood School (K-4) is a good public facility, while kids in Grades 5-8 can attend Frank E. Thompson Middle School. For high-schoool-aged children, William S. Rogers High school is practically in the neighborhood. There's also the private Cluny School (PK-8). For a tour of homes for sale in Newport's Cliff Walk area, contact us online or call (401) 845-9500 to speak with a Hogan Associates REALTOR® who is familiar with the neighborhoods of Newport.